In 1973 French jazz pianist and composer Claude Bolling released his wildly successful“Suite for Flute and Jazz Piano”, created for virtuoso classical flutist Jean-Pierre Rampal and jazz trio. It remained on the Billboard Top 40 for ten years, and still stands as a satisfying high point in the musical rapprochement of jazz and classical elements. That suite and other classical/jazz crossover works by Bolling will be performed by AmiciMusic in a White Horse Black Mountain show entitled “Jazzical 2” on Friday, July 10 at 7:30 p.m. 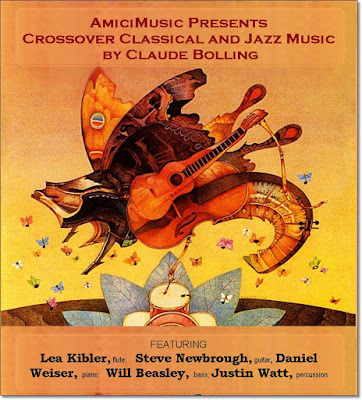 The musical ensemble will consist of flutist Lea KIbler, guitarist Steve Newbrough, pianist Daniel Weiser, Will Beasley on bass and Justin Wyatt on percussion. Other Bolling compositions round out the program, including movements from “Picnic Suite for Guitar, Flute and Jazz Piano Trio” and selected solo piano works. Claude Bolling was born in Cannes in 1930. A child prodigy, he was playing professionally with major jazz artists like Lionel Hampton, Roy Eldridge and Kenny Clarke by the age of fourteen. The jazz avant-garde beyond bebop held little interest for him, and he was a force, along with Oscar Peterson, in the traditional jazz revival of the late 1960s. Although he’s a prolific film composer, Bolling is best known for his jazz/classical “crossovers”, the best known being the Rampal disc, with a structure inspired by Baroque dance suites but animated by a modern swing sensibility. Following the success of the flute suite he went on to collaborate with with musicians from various genres, including guitarist Alexandre Lagoya, violinist Pinchas Zuckerman, trumpeter Maurice André and cellist Yo-Yo Ma.